The external façade of the M Boutique Hotel is quite imposing as you could easily mistake the gigantic quirky M logo for a modern nightclub. Yet, when you approach to the well designed shop lots, your perception will change immediately by seeing the well displayed glass window with quirky elements of design. The location is slightly off and outside of the infamous Ipoh old town separated by the Kinta river. You may need to ask for direction in order not to miss the turn by entering to the right street especially if you are not familiar with this neighbourhood. Keep a eye with the "OLD TOWN" wording on the "bee hive" tan color external façade instead of the M Boutique hotel as it is more visible on the eye level while you drives through from the main road. The lobby is entrancing and the festive season atmosphere was only a part the unique design concept. Malaysia is already lacking of real good design boutique hotels and the M Boutique Hotel Ipoh surely had added something refreshing and homage to the sights and sounds of Malaysia's diverse culture and personalities. Paying attention to smallest thing is what the M Boutique Hotel does and to take pride in its unique personalities by delivering service with cheeky, casual flair.The interior plays around with the raw material to create the industrial chic with a touch of warmth.The reception back wall is extremely eye-catching, displaying in the style of old Chinese medicine cabinet drawers gives an urban vintage look and the creative use of wood in the lighting compliments the old boards flooring contrasting a bright contemporary in design.The antique-like old suitcases stacked on top of each other to draw the eye to more than one location while the large window pane iron doors bringing a lot of natural light into the lobby and the public area as well as the adjacent restaurants. Next to the reception, there is a boutique that sells custom hand made products that is carefully chosen to suit the style and mood. From the house own design clothing, stationary, plush cushions to home wares as well as the the handcrafted toiletries products that are all limited in quantity. The wide selection of products from the M Shop are produced to befit your lifestyle. Somehow you may wonder, is this a hotel or a lifestyle boutique shop? The owner of the M Boutique hotel clearly has a great eye for detail, as the design and decor details delights you everywhere you look. From multiple artwork styles on the corridor walls, to beautifully chosen furniture that fills little unexpected niches, it makes you want to explore every nook and cranny! Before you even stepped into the elevator to get to your room, rolls of giants clocks displaying in different local times above the elevator continue with more design elements seen at every corner. Of course, it just doesn't end there, the three stories hotel floors once again are transformed into three different themes. On the Adventure Theme Floor where inspiration comes from the Malaysia Safari dazed with a hint of danger, bloody yet with luxe romance. Wild animals like tigers, zebras and the giraffes adorn he walls of each room in their different cycles of life. The Majestic Floor inspired by the The Majestic from New York City returns to the raw industrial form of decor with a hint of the Asian affinity for numbers, text art and typography art albeit with a twist. Cheeky! The highest floor is The Excelsior Floor is in contrast to all floors below, through the use of bold colors against pastel backgrounds with various pretty insect wall pictures. Design elements are found everywhere and it doesn’t seem when to stop. It may seem busy yet all the furniture and displays have been carefully considered and well located to create the Yin & Yang effect. Inspiration is found at every corner, it is really fun to go around looking out for surprises on every floor as each floor are designed in a different theme and mood. You may think that you have just walked in to a modern art gallery instead. The interior is absolutely visually stunning! The room is small yet the space is very well used and provides all the practicality for any hotel room has to offer. It is designed in such a way to maximize the comfort level yet not forgetting being playful and enjoying the fun with the surrounding modern and chic ambience. All rooms are Equipped a 12' thick mattress with a comfortable duck down plush top, topped off with dual density pillows and a crisp duvet. The lighting in the room was more than one would expect, the black iron hanging “chandelier” hanging above the bed did not really crowd the room. The use of stenciled pictures on the walls throughout is superb as well as the thoughtful and curious placement of hooks for clothing and bags. practice. It has all the mod-cons that one expects and more.The bathroom is a vision in black and white tiles with a hint of colour given by the Chinese blue porcelain stool in the shower with efficient bright lighting. The use of sliding doors sharing with the toilet is the perfect way to maximize the limited space given. House brand toiletries are very pleasant and the labeling towels are in high quality. The only concern we had during our stay was the hygiene and sanity, as various spots of stains are found here and there especially on the toilet seats which has been carelessly overlooked by the housekeeping. The hotel does not run its own restaurant yet breakfasts are given with two options to meet Western and Asian needs.The adjacent local Bistro and cafes - The Myth Eatery & Bar and the local chain Old Town White Coffee. 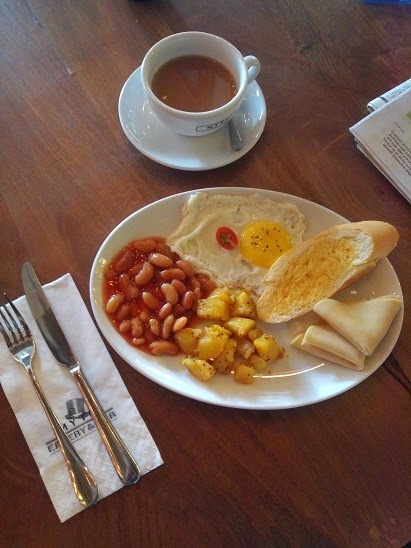 The breakfast at The Myth Eatery provides very limited choice for selection yet the quality of food is also rather poor despite claiming to use fresh product with quality ingredients.The Asian breakfast in the Old Town White Coffee restaurant is more enjoyable with generous proportions and tasty food. In fact, the true attraction for food lies outside the hotel as most guests will probably save their appetite for all the great restaurants around the old town area by walking distance. There is a pleasant library lounge living room on the first floor continues with the seamless design with rattan recliners, ornate tables, book shelves safari themed lamps and jut rugs. Daily newspapers are provided as well as various current issues of magazines. Adjacent to the living rooms is a very well equipped gym for those that need to work off all the over indulgence from the day before. On the other side of the living room, there is a separated area for self service laundry service which is an unexpected touch for such a small hotel. Punching well above its weight, the M Boutique hotel certainly has put many international class design hotels to shame with its style of image branding, especially the design factor. Domestically, it has certainly become a bright light on Ipoh hotels scene with such fun and whimsical design approach yet full of inspiration with wow factors.